I discovered this lovely novel because I’m a big fan of The Hare with Amber Eyes, a memoir written by the author’s grandson, Edmund de Waal. (More about that book at the end of this post.) Elisabeth de Waal survived “interesting times” as the Chinese proverb would have it; that is, she and her family survived World War II, as so many Jews did not. She was born Elisabeth von Ephrussi, in 1899, daughter of one of the great banking houses of Europe, growing up in a fabulous palais on the Ringstrasse in Vienna. She studied philosophy, law, and economics, and corresponded with Rilke, to whom she sent her poems. The Exiles Return is one of several novels she wrote; it was never published in her lifetime. The Exiles Return is about three people who come to Vienna from the United States in the early 1950s for very different reasons. Austria, like much of Europe, was a mess after the War and it was partitioned by the Allies, who occupied it until 1955. Kuno Adler is a medical researcher who hopes to reclaim his old job; Theophil Kanakis is a wealthy Greek who hopes to reclaim a life of partying and subversion; Resi is a young girl whose Austrian immigrant parents hope that she will recover from depression in a new environment. These three people give us entree into different parts of society; there are complex layers of expectations, disappointments, and thinly veiled violence that operate on their lives. The pleasure of this novel is in the complexity of the characters and de Waal’s refusal to make things simple. 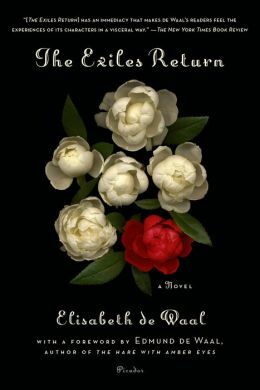 The publisher compares her writing to Irene Nemirovsky’s books about World War II in France, and there is something to that comparison, but for me, de Waal is the more engaging writer. Back to The Hare with Amber Eyes: in one of the great family memoirs of recent years, Edmund de Waal combines memoir with art and history in the most compelling way. The hare of the title is a piece of netsuke that becomes a leitmotif in the story of the Ephrussi family, who started in Odessa as grain traders and became a banking family in Vienna and Paris that rivaled the Rothschilds. Because Edmund de Waal is a well-known ceramicist, the memoir is not just about a piece of art, but in the poignant and exquisite way de Waal tells the story, the book itself becomes a work of art. This entry was posted in Fiction, World War II. Bookmark the permalink.